If the first volume of Delicious in Dungeon was about assembling a posse, and the second and third about turning monsters into meals, then the fourth is about friendship — specifically, the strong emotional bond between Laois, Marcille, and Falin — and revenge, as the gang finally comes face-to-face with the Red Dragon. The showdown takes place inside a walled city whose narrow, maze-like streets give them a strategic advantage over their Godzilla-sized foe. And as exciting as the fight is, the real payoff is what follows, as Laois and Marcille discover that bringing Falin back from the dead isn’t a simple proposition. It’s in these moments that Ryoko Kui proves a more deft storyteller than we initially realized, effortlessly shifting gears from comedy to drama without mawkishness or cheap jokes. Instead, we’re allowed to contemplate the real horror of being eaten alive — as Falin was — and the real possibility of a character dying for good. If I’ve made volume four sound like a bummer, rest assured it isn’t. Seshi gets his turn in the spotlight with a weaponized assortment of kitchen tools, while the rest of the gang endures its share of fumbles and miscommunications on the way to catching their dragon adversary. 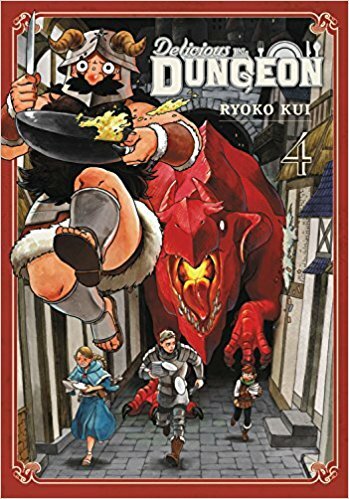 Though I suspect the next volume of Delicious in Dungeon will revert to a monster-of-the-week formula, that’s OK; Kui has firmly established her dramatic and culinary bonafides in volume four, leaving the door open for more character development in the future. Recommended. There are two ways to read this exchange: as a tacit admission that the cooking elements of Golden Kamuy sometimes occupy more real estate than the battles, or a tacit admission that the series is more compelling as a study of Ainu culture than a bloody frontier adventure. I vote for the second interpretation, as the series’ frequent detours into the food, medicine, and mythology of the Ainu are fascinating, offering a window into a culture that has been largely hidden from Western view. 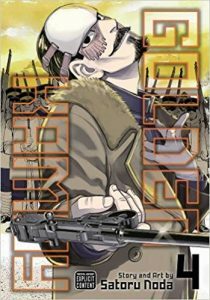 Golden Kamuy is on weaker footing, however, when focusing on its secondary characters and subplots. None of the other gold-seekers are fleshed out as carefully as Asirpa and Sugimoto, despite Satoru Noda’s efforts to give each villain a unique motivation for wanting the treasure. The newest baddie — Kazuo Hemni — exemplifies this problem to a tee: though he’s been given a particularly grisly backstory to explain his murderous proclivities, he’s such a textbook sociopath that he barely rises above the preternaturally-calm-and-savage type. The art, too, sometimes has a perfunctory quality; in several scenes, Noda’s use of a Photoshopped background doesn’t mesh well with the hand-drawn elements, resulting in an awkward collage. Noda’s use of perspective can also be a distraction. He has difficulty drawing bodies to scale, especially when he’s depicting Asirpa and her family, some of whom look more like Smurfs than people in their head-to-body ratio. Still, the camaraderie between Asirpa and Sugimoto, and the well-staged action scenes more than compensate for the occasional roughness of the execution or flatness of the characterizations. 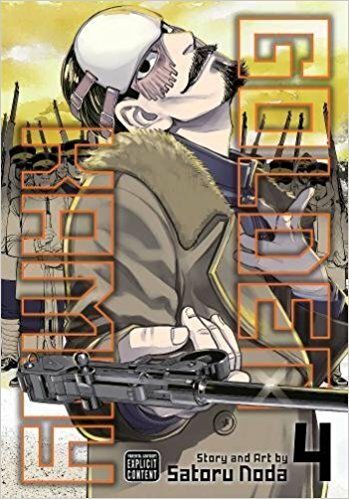 Golden Kamuy continues to entertain, horrify, and educate in equal measure — something I can’t say for any other manly-man manga that’s currently being published in English. Recommended. Sean Gaffney offers a thoughtful appraisal of My Boy, pronouncing it “a good, meaningful work, told with a deft hand,” while Chris Galaver declares Seiichi Hayashi’s Red-Colored Elegy a classic. 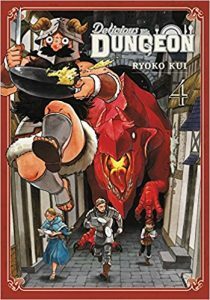 Over at NerdSpan, Keith Hendricks checks in with Delicious in Dungeon and One-Punch Man. New York Times television critic James Poniewozik recently posted an essay on the defining problem of the streaming era: the show that takes 10 or 20 episodes to find its footing. Should you start watching from the beginning no matter what, or is it OK to skip ahead to the section where the characters, premise, and plot finally gel? This question has obvious implications for manga readers, since many series’ debut volumes are plodding, incoherent, or so focused on laying the groundwork for developments in chapter 30 that they’re a chore to read. Poniewozik gives his blessing to folks who want to get to the good stuff, noting the degree to which television shows evolve in response to viewer and critical feedback, just like manga. “TV is an improvisatory art,” he notes, arguing that it’s “misleading to treat most series, even the greats, like fully formed wholes set down according to careful design.” So if you’ve heard that the first volume of From Eroica With Love is a dud, you have Poniewozik’s blessing to start with volume two. Last week at Experiments in Manga, I announced the winner of the Anonymous Noise give away. The post also includes a list of manga which have characters who have notable singing voices. I got a particularly kick out of the fact that not all of the manga were necessarily music manga. Also, a bit of a heads up: I’m switching around my usual posting schedule. Normally the second week of the month would be devoted to the Bookshelf Overload feature, but I’ll be posting an in-depth review this week instead–Yeon-Sik Hong’s award winning manhwa Uncomfortably Happily is being released in English by Drawn & Quarterly on Tuesday and I’m working on putting the finishing touches on my write-up. Spoilers: I enjoyed the work immensely. As for interesting reading elsewhere online: Hitomi Yoshio, a professor and translator, wrote a little about teaching Japanese Literature in Translation. And speaking of Japanese literature in translation, it looks like the second volume of Yu Godai’s Quantum Devil Saga: Avatar Tuner will finally be released sometime later this summer. (I enjoyed the first volume a great deal when it was published three years ago and sincerely hope that the wait between future volumes is much shorter.) I’ve known about the upcoming translation of Kazuki Sakuraba’s A Small Charred Face for a while, but now it’s official–Haikasoru will be releasing the novel in the fall. Sakuraba may best be known as the creator of Gosick, but my introduction to author’s work was through Red Girls: The Legend of the Akakuchibas, which I loved. Finally, I’d like to draw attention a series of fascinating Golden Kamuy Cultural Notes & Video References put together by @zeppelichi on Twitter. Blinded by the Ice by Saicoink (An Nguyen). In general, I don’t buy very many fan works or doujinshi, generally preferring to support artists’ original comics over their explorations of other people’s creations. However, I do occasionally make exceptions and I was very excited for Saicoink’s Yuri!!! on Ice fan book Blinded by the Ice. In addition to some bonus comics, illustrations, and research notes, the volume focuses on two main stories. The first and longest, Don’t Leave Me This Way, was probably my favorite comic of the two. I enjoyed Makes Me Think of You as well–it’s a charming and sweet holiday story which takes place after most of the events of the original anime series–but Don’t Leave Me This Way is the one that really impressed me. 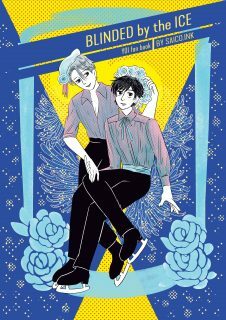 The comic is set in the late seventies and early eighties, featuring an alternative universe in which Victor and Yuri’s relationship must develop over both time and distance due to the fact that Victor is a high-profile athlete for the USSR. The only time the two of them can really meet in person is during competitions and even then it is very challenging and difficult. Blinded by the Ice is fantastic; I love the humor and insight that Saicoink brings to the stories and the time and effort Saicoink put into research really pays off, too. Delicious in Dungeon, Volume 1 by Ryoko Kui. I enjoy tabletop role-playing games (or at least enjoy being present while other people are playing them) and I love food manga, so Delicious in Dungeon was a series that immediately caught my attention. The groups that I’ve played pen and paper RPGs with actually tended to devote a fair amount of attention to the food within the games. Our adventures never quite turned out how it does for Laois and his dungeoning companions, though. When, partially due to hunger, his party is nearly wiped out by a dragon, Laois and the other survivors find themselves facing the prospect of having to launch a rescue mission to save one of their own. There’s just one problem: their supplies are limited and they don’t have any food. And so Laois proposes that they simply find what they need to eat and sustain themselves inside the dungeon itself, something that he’s apparently been wanting to try for a very long time. The others, on the other hand, are much more skeptical. Conveniently, they are all fortunate enough to meet a dwarf who is much more skilled and experienced than Laois when it comes to making monsters palatable. The conceit of Delicious in Dungeon is frankly brilliant. Unsurprisingly, I loved the first volume of the series and definitely plan on reading more. 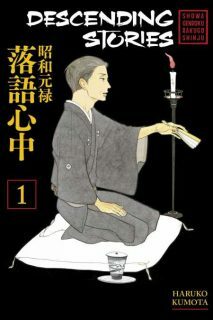 Descending Stories: Showa Genroku Rakugo Shinju, Volume 1 by Haruko Kumota. 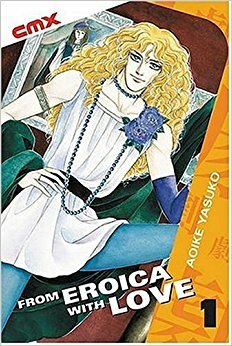 Although I haven’t actually had the opportunity to watch it yet, Kumota’s manga series Descending Stories was first brought to my attention due to its recent anime adaptation. The excitement surrounding the anime and the licensing of the original manga made Descending Stories one of the debuts I was most looking forward to in 2017; I was not disappointed. Rakugo is a traditional Japanese performance art which isn’t as popular as it once was but still has a devoted following. Familiarity with rakugo isn’t at all necessary to enjoy Descending Stories, but readers who have at least some basic understanding of it will likely get even more out of the series. But while rakugo is an important and interesting part of Descending Stories, it’s the relationships and drama between the characters that really make the manga so engrossing and compelling. Kyoji is an outgoing young man who has recently been released from prison. Curiously, the first thing he does with his freedom is to seek out Yakumo, a famous rakugo artist, and demand to become his apprentice. Up until this point Yakumo has always rejected those who want to study under him, but to everyone’s surprise on a whim takes Kyoji into his household. 1/2 cup What Did You Eat Yesterday? 2 tbsp. Not Love But Delicious Foods Makes Me Happy! Though that recipe sounds unappetizing — the manga equivalent of a herring-and-banana smoothie — Delicious in Dungeon is surprisingly good. Volume one plunges us into the action, pitting a team of warriors and spell-casters against an enormous dragon. Though all six fighters are experienced, they’re so compromised by hunger that they make silly mistakes that result in one member getting eaten. When the team regroups, two members defect to another guild, leaving just Laois, a knight, Chilchuck, a “pick-lock,” and Marcille, an elf magician. The three resolve to rescue Laois’ sister from the Red Dragon’s belly, but their chronic lack of funds forces them to adopt a novel cost-saving strategy: foraging for food inside the dungeon instead buying supplies for the mission. The trio soon learns that catching and cooking monsters is harder than it looks. Despite the astonishing variety of creatures and man-eating plants that inhabit the dungeon, almost none appear to be edible: some have stingers or hard shells, while others are so disgusting that no one can imagine how to prepare them. When Senshi, a dwarf, volunteers his culinary services, the group is pleasantly surprised by his ability to transform the most unpromising specimen into a delicious array of soups, tempuras, and jerkies. Even more impressive is Senshi’s ability to improvise the tools he needs to make gourmet dishes; he’s the D&D answer to Angus MacGyver. Subsequent chapters follow a similar template: the group enters a new area of the dungeon, encounters new monsters, and devises new ways to cook them. What prevents this basic plotline from growing stale is Ryoko Kui’s imaginative artwork. Every chapter is studded with charts and diagrams illustrating the dietary habits of dungeon crawlers and the unusual anatomy of dungeon dwellers, from slime molds to basilisks. These meticulous drawings provide a natural jumping-off point for Senshi to wax poetic about the flavor of dried slime, or describe the safest method of harvesting mandrakes. If the series’ rhythm is predictable and the jokes sometimes obvious — one character declares that basilisk “tastes like chicken” — the specificity of Kui’s vision keeps Delicious in Dungeon afloat. Every chapter yields a funky new monster and an even funkier recipe from Senshi — all rendered in precise detail — while the script has the rhythm of a great workplace sitcom; it’s a bit like watching The Office or WKRP in Cincinnati, but with jokes about the merits of giant scorpion meat instead of arguments about the annual Christmas party. 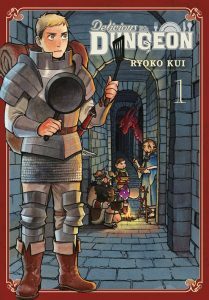 I don’t know if I’d want to read 10 or 20 volumes of Delicious in Dungeon, but I’m eager to see where the next installment goes.